Stand Up For Tibet, Don’t Fall Asleep! Time to get visible, time to listen to the voices of Tibetans in Tibet, time to end China’s repressive policies and time to fight for RANGZEN. It’s an emotional time, and sometimes it really gets to you but we need to stay strong, focused, work together and most importantly, support each other. SFT UK has a very small board and at times it can be very stressful but I am very honoured to have a supportive community around me, which really makes a difference to your energy levels and your work for Tibet. SFT UK are organizing a fundraising event this Saturday and without even asking for anything a number of Tibetans have come to me and offered their helping hand, they have offered to cook, to be on the ticket stand, to sing, and most importantly they will support the work for RANGZEN. It really touches me and lifts a weight off my shoulders. It also inspires me to continue the work knowing SFT UK and I have the support of the people around us. In a time like this we need this kind of encouragement, especially for our youth, nurture them, guide them, bring them forward. If they or we make mistakes, teach them the ropes the best you know. I want to see our generation and the future generation united with support for each other, no matter what organisation you work for we are all Tibetans at the end of the day using various platforms – embrace them. Two weeks ago I attended the China Forum talk at the Labour Party conference, where I listened to China’s Minister Qin Gang talk for 20 minutes on China’s “peaceful developments”. It was the most painful talk I have ever had to endure. Just 3 hours before the talk I heard the news of two Tibetan monks self-immolating so it was vital I mentioned this incident and of course I got the absolute propaganda message and my question was not answered. So then I went to Switzerland for RAP FOR TIBET! It was a really great event, very impressed with the organizing and the turn out of a truly mixed audience. It reminded me of when I use to go those underground hip-hop places in Brixton, it had that same feel except there was a massive Tibetan flag on stage and rappers were talking, rhyming and promoting the Tibetan issue. IT WAS BIG! 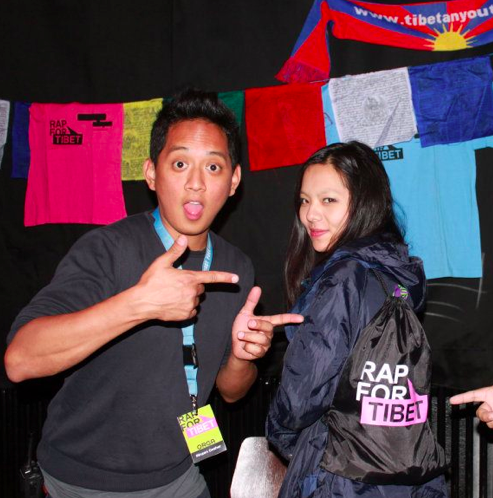 GOT MY RAP FOR TIBET BAG. HAVE YOU? While I was out there we were hearing more news of self-immolations, so Tibetan Youth Association in Europe and I decided to meet up and discuss what we can do to push our movement here in Europe. It was productive and also gave us a chance to create a better relationship with each other. Here is our message to you, bearing in mind Rap for Tibet was the night before. …Before I go, just to mention to you all to keep your spirits high, when you feel low be amongst your Tibetan friends and confide in each other – personally I think it helps, because we just have to look at each other to understand the sorrows and pain we feel. Bhoe Gyalo!